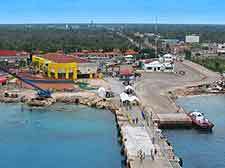 Cozumel International Airport offers very limited ground transportation options and the airport minibus company has something of a monopoly on ground transfers. If you are not being collected by your hotel via a free shuttle service, then the only alternative to taking the airport minibus is to walk beyond the airport's perimeter to Avenida 65, from where taxis are available. Airport minibuses are available from outside of the Arrivals Hall, but tickets must be purchased from inside the hall before boarding. Buses run to all the island's major resorts. Many of the island's popular hotels provide vehicles to bring guests from the airport to their establishments and invariably at no cost or as part of a package deal. Visitors should contact their hotel ahead of their arrival at the airport to check whether the establishment provides airport pick ups. Taxis are not permitted to wait within the airport grounds, so passengers requiring taxi services will need to make the one block walk to avenida 65, from where cabs are available.